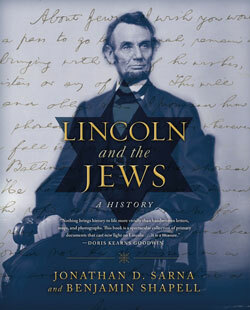 In this probing, lavishly illustrated volume, the historian of American Jewry, Jonathan Sarna, and Benjamin Shapell, a leading collector of Civil War documents and artifacts, interweave two texts: a chronicle of Lincoln’s cordial relations with Jews and an extensive gallery of letters, photos and prints. One comes away from the book—which features almost 100 items signed by Lincoln—with fresh appreciation for his spare, rhythmic style and his abiding concern for justice. Unlike the general run of his peers, he never harbored anti-Semitic sentiment and, as president, he regularly took issue with subordinates who denigrated or discriminated against Jews. Lincoln didn’t just tolerate Jews and defend their right to equal treatment. In 1862, he assigned several Jewish chaplains to army regiments, disregarding the official congressional rule restricting the positions to Christians. So eager was he to approve the most qualified men as Union quartermasters that he initially paid no attention to their religion and selected a number of Jews solely because of their talent. About 50 northern Jews served as quartermasters during the war, thanks in part to Lincoln’s freedom from prejudice. Years before becoming president, Lincoln had worked hand in hand with Jewish colleagues in law and politics, unwilling to arbitrarily exclude anyone from the pool of his contacts. Abraham Jonas, a well-connected Whig lawyer and orator, became Lincoln’s close associate in Illinois—although the authors may go too far in implying that an intimate friendship existed between them. Lincoln certainly meant it when, in an 1860 letter to Jonas, he called him “one of my most valued friends,” but the presidential aspirant seems to have meant political co-worker, not personal companion. Readers can decide this question for themselves, since the authors reprint the relevant exchange of letters between Lincoln and Jonas. Sarna and Shapell intertwine Lincoln’s generosity toward Jews with his attachment to the Hebrew Scriptures. “The judgments of the Lord are true and righteous altogether,” he declared, quoting from Psalm 19 at a pivotal point in his second inaugural address.And his letters are full of Old Testament references: A brief note to Treasury Secretary Salmon P. Chase borrows its beginning—“In these troub’lous times”—from the Book of Daniel. Like many Protestants, Lincoln found the Exodus story indispensable as he pondered how African Americans could eventually live a life in freedom. He thought the biblical account of Jewish deliverance from Egyptian slavery supplied the proper template: True liberty for three million Southern slaves would require (he said in 1852) “restoring a captive people to their long-lost fatherland” of Africa. A decade later, Lincoln was still preaching this “colonization” doctrine—the voluntary departure of black Americans for some other place—although by then he had turned his focus to Central America. Only one Lincoln letter gives the authors momentary pause about Lincoln’s sentiments regarding Jews. He begins an 1865 missive to Secretary of War Edwin Stanton with the strangely blunt, two-word phrase “About Jews”—on its face, a stereotyping remark. However, the rest of the letter reassures: Lincoln goes out of his way to solicit Stanton’s aid in reversing indignities suffered by two Jews at the hands of the War Department. Chronicling Lincoln’s connections to Jews and Judaism, Sarna and Shapell have deepened and sharpened our understanding of the 16th president: a zealot for liberty and a biblically informed champion of equality and charity for all. Richard W. Fox is the author of Lincoln’s Body: A Cultural History and teaches history at the University of Southern California.